Jane Goodall is one of the most influential and inspirational conservationists in the world. Image from the Jane Goodall Institute. Happy International Women's Day! This week we celebrate some of the smart, passionate, and strong women in nature conservation and wildlife photography - some you'll know, and some you probably won't know. Every one of these ladies has played a critical role in protecting biodiversity, and/or sharing the wild with the public through photography or other works. Emma Talbot was a cousin of William Henry Fox Talbot, a pioneer of many early photography methods in the 1830s. She introduced the art of photography to her husband John Dillwyn Llewelyn, who produced some of the earliest known "wildlife" and nature photos in the 1850s. Emma did all of John's printing and took photos herself, as did their daughter Thereza, John's sister Mary, and Emma's cousin Jane St John. The work of the Talbots and Llewelyns paved the way for wildlife photography. One of John Dillwyn Llewelyn's early nature photos featuring a stuffed otter, from 1852. Emma Talbot introduced him to the art. Image from Lomokev. Celia Hunter was a great admirer of Amelia Earhart, and became a skilled service pilot in WWII. Because the US military didn't allow women to fly to Alaska, she and her friend Ginny Wood commandeered old rickety planes to fly to Fairbanks on their own. In the 50's, Celia and Ginny moved to Alaska where they created Camp Denali, to share Alaska's natural beauty with visitors. Celia founded the Alaska Conservation Society and the Alaska Conservation Foundation to fight plans to decimate the wilderness. The night before she died at age 82, she was up late writing letters to the US Congress to stop oil drilling in the Arctic. Celia was responsible for protecting over 100 million acres of federal land in Alaska over the course of her life. Alaska's wilderness is unrivaled, and protected thanks to Celia Hunter. Image by Paxson Woelber. Rachel Carson is of course best known for her game-changing book Silent Spring, which focused on the problems caused by pesticides. Many credit her for kick-starting the modern environmental movement. She was also a marine biologist, and before Silent Spring, wrote several books about life in the oceans and marine conservation, including Under the Sea-Wind, The Sea Around Us, and The Edge of the Sea. My friend Harriet wrote a great song about her: have a listen! Rachel Carson conducting field research. Image from the US Fish and Wildlife Service. Windland Smith Rice, daughter of FedEx founder Fredrick W. Smith, was a well-known professional wildlife and photographer who regularly contributed to National Geographic and Nature's Best Photography. She was known in the photography community for encouraging up and coming photographers and for her passionate advocacy for conservation. After she suddenly died of Long QT Syndrome Type 2 at the age of 35 in 2005, Nature's Best Photography dedicated their annual photo competition to her. Today, the Windland Smith Rice International Awards is one of the most prestigious wildlife and nature photo competitions in the world. Windland Smith Rice inspired and encouraged. Image from Nature's Best Photography. Dr. Gladys Kalema-Zikusoka is a wildlife veterinarian from Uganda, and was the first woman to be the Veterinary Officer for the Uganda Wildlife Authority. She pushed for the re-introduction of wildlife into Uganda after years of civil war and poaching. Gladys founded the non-profit organization Conservation through Public Health, which provides services to protect gorillas and other wildlife, improve community health, educate people about conservation, and provides financial alternatives for people desperate enough to poach for income. Gladys Kalema-Zikusoka cares for the 400 or so mountain gorillas that live in Uganda. Image from Geographical. Mountain gorillas, some of our closest evolutionary relatives, are highly endangered. Image by Kate. 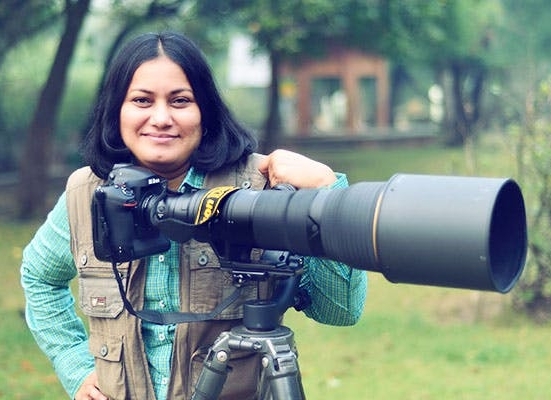 In a field often dominated by men, Rathika Ramasamy is one of India's first female professional wildlife photographers to be recognized internationally. She started a career in software engineering, but after her uncle first gave her a camera, she began shooting trees and flowers, and later, animals. Rathika specializes in bird photography, but has also captured spectacular images of many other animals, especially big cats. In 2015, she received the "Inspiring Icon Award" from Sathyabama University in Chennai. Rathika Ramasamy stands out from the male-dominated crowd. Image from yourstory.com. 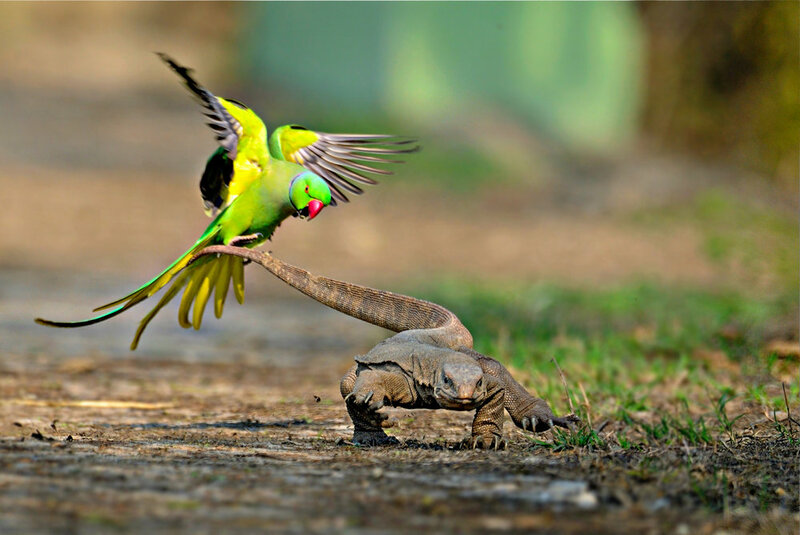 A rose-ringed parakeet defends its chicks and territory from a monitor lizard. Image by Rathika Ramasamy, via Cambyte. Be sure to check out the stories of the talented female photographers and conservationists featured here on the Wild Focus Project: Patricia Bauchman, Elisa Dahlberg, Barbara Driscoll, Denise Ippolito, Jenaya Launstein, Dee Ann Pederson, and R.J. Walter. You can also find a huge list of amazing female wildlife photographers here.